What Is The Tuskegee Airmen Scholarship Foundation?In order to continue to preserve the Tuskegee Airmen legacy, the “Tuskegee Airmen Scholarship Foundation” (TASF) was established in 1979 to serve as a vehicle to provide annual scholarships to outstanding young people in their academic quest for excellence. With an initial goal of one million dollars, seed money came from pledges, contributions, and the proceeds of a Memorial Banquet honoring General Daniel “Chappie” James Jr. The goal was achieved in 1997 and in 2007 the fund balance reached $2,000,000.00.TASF is a non-profit 501(c) (3) organization located in Los Angeles, California. The Board of Directors is comprised of Documented Original Tuskegee Airmen (DOTAs) and corporate and community leaders committed to providing leadership by ensuring that funds are available to assist financially disadvantaged and deserving students in the pursuit of their educational goals, preferably leading to careers in the fields of aviation, aerospace and science technology. On March 29, 2007, the Nation honored the Tuskegee Airmen with the Congressional Gold Medal, the highest award bestowed on our national heroes. More…. THE FALLEN 66, ARE THEY MY BROTHERS KEEPERS? The Unlocking Tuskegee Airmen X files Competition (UTAXFC) is a STEAM showcase to enable student teams to Unlock the untold stories of the Fallen 66 and the Tuskegee Airmen at Large. This project invokes the sacred code of all combatants “That No Man Left Behind”, and that’s why The Fallen 66 Project is aligned with The Presidents “My Brothers Keepers” Initiative. The competition will provide student teams with exclusive video, For Love Of Liberty Multimedia, Hollywood’s POV, photos, music, artifacts, and social media and the forensic science to construct a story board for presentation to a panel on Oct. 7th, USC Silicon Beach. The teams will deploy Fallen 66 STEM curriculum to deconstruct the forensics of the Tuskegee Airmen’s Missing In Action-Killed In Action classification. Compton Unified School District has been the use case for the design of the project and will extend to cohorts such as the Level Playing Field Institute. Teachers, students and organizations will compete in a shark tank experience for recognition and investment in the most viable multimedia project presented through a series of shark tank-like pitch events, culminating in a finals that will distribute scholarship and prizes for the winning teams. Team Head Coaches and Student Responsibilities: rules of engagement and how the participants will run their challenges, and work with students. •Team Head Coaches are responsible for the behavior and ethical conduct of their students, both inside and outside of the classroom. This includes, but is not limited to, postings in social networks, Chat Rooms and Team Talk, as well as in experiments conducted by the team. •Students should conduct themselves ethically and in compliance with the competition rules and regulations when using the Discussion Forums Team Talk and online forums as well as when conducting experiments. Review and understand these statements while participating in the UTAXFC. 1.I understand the project my team members and I plan to work on or are working on is our original work and that the resources and references used in our project will be noted throughout our research. 2.I will not give out any personal or identifying information without my parents’ or guardians’ permission, including, but not limited to, my name, e-mail address, home address, telephone number, parent’s work address/telephone number, or the name and location of my school. 3.I will tell my parents or guardians right away if I come across any information that makes me feel uncomfortable. I will also tell my Team Advisor and ask them to inform UTAXFC Mission Control. 4.I will never agree to get together with someone I “meet” online without first checking with my parents. If my parents or guardians agree to the meeting, I will be sure that it is in a public place and bring my parents or guardians along. 5.I will treat other students, Volunteers and Team Head Coaches with the upmost respect while participating in UTAXFC – this includes always using appropriate language and never being rude or disrespectful when interacting on Discussion Forums, Chat Rooms and Team Talk, as well as in experiments conducted by the team. 6.I will conduct myself ethically and in compliance with the UTAXFC rules stated below when using the Chat Rooms, Discussion Forums and Instant Messaging, as well as when conducting experiments. 7.I understand that if I do not follow the guidelines of this Code of Conduct, my team members and I may be disqualified from the competition. 1.The online Registration Period is open from AUGUST 2015 through SEPTEMBER 2015, After this deadline, teams may no longer register to participate in the current UTAXFC. 2.The competition begins immediately upon registration. Teams have until OCTOBER 1, 2015 to submit their Mission Folders (all submission components) on the UTAXFC website, Mission Folder content or attachments will not be accepted by other means. After this deadline, no other Mission Folders or Mission Folder attachments will be accepted. UTAXFC reserves the right to change the deadline. Any changes to the deadline will be publicized on the website. 3.The Virtual Judging Period lasts through OCTOBER, while the Regional Judging period takes place the fourth week in SEPTEMBER. Winners will be notified by the end of SEPTEMBER. Scores submitted by the Virtual and Regional Judges are final. Team Make-up and Eligibility 1.To compete in UTAXFC participants must be part of a complete team. A complete team includes both three or four students from the same grade and state, and, one adult Team Head Coach Advisor who is over the age of 21. 2.All students and Team Head Coaches who wish to participate must register and have a complete team on the UTAXFC website prior to the close of registration. 3.Provided the team composition remains unchanged, teams may submit multiple Mission Folders in the same competition year. If, after scoring, it is discovered that a team has placed in multiple categories for their grade and region, only the highest placement will be awarded. Students wishing to submit multiple Mission Folders must register with different usernames and a new team name, though still keeping the same team composition, on the UTAXFC website. 4.Team members do not have to be from the same school, but must be from the same grade and state. 5.Each student team member must make significant contributions to the success of the team and be a full participant in the development of the Mission Folder. Eligibility Requirements 1.Students must be U.S. citizens or a legal U.S. resident, and must be officially enrolled in either 9th, 12th grade at a U.S. school-based public, private or home school. 2.Legal U.S. citizens who are educated outside of the U.S. and are in the sixth, seventh, eighth or ninth grade are also eligible to compete. 3.For administration of awards, competition winners must provide their full name, home address, home phone number, a Social Security Number for either themselves or their parent/guardian and signature of a parent/guardian, upon request. Team Advisor Eligibility To sponsor an UTAXFC team, the Team Advisor must meet each of the below requirements and be register with Mentor.org for background check. •A Team Advisor must be at least 21 years of age. •Team Head Coaches must be one of the following: a teacher, coach, counselor, leader in a youth organization or parent who meets the below requirements. A parent may serve as a Team Advisor as long as the parent is known at the student’s school/organization and has education or youth leadership experience, while also meeting the other eligibility requirements of a Team Head Coach. •Team Head Coaches must have access to the Internet and an active email in order to communicate with UTAXFC Mission Control. •Team Head Coaches can mentor as many student teams as they choose, but must ensure that students are only participating with one team of students per competition year. Though students have the ability to submit multiple Mission Folders, teams must stay within their original format for each submission. Participant Responsibilities Student Responsibilities Students should conduct themselves ethically and in compliance with the UTAXFC Competition rules and online etiquette guidelines when using the Chat Rooms, Discussion Forums, webinars and Instant Messaging, as well as when conducting experiments and surveys. Team Advisor Responsibilities Team Head Coaches are responsible for the behavior and ethical conduct of themselves and their students, both inside and outside of the classroom. This includes, but is not limited to, postings in the Chat Rooms, Discussion Forums, webinars and Instant Messaging, as well as in experiments and surveys conducted by the team. Team Head Coaches are responsible for demonstrating and encouraging respect and teamwork within their own teams, and to others in the UTAXFC competition. For teams to be eligible to compete in UTAXFC , Team Head Coaches must ensure that all students on a team are from the same grade and state. If the students choose to submit more than one Mission Folder, the students must keep their original team composition for each submission. Disrupt DAC and Mission Folders Mission Challenges Teams must select a problem that is related to one of the Mission Challenges listed on the UTAXFC website. Teams may change their Mission Challenge during the competition any time prior to the Mission Folder submission deadline. There is no requirement to notify UTAXFC of a change in Mission Challenge. Mission Folders Teams must select a Mission Challenge and answer all of the questions in their Mission Folder in the character space provided utilizing either the scientific method, scientific inquiry or the engineering design process. Information about each of the processes can be found on the UTAXFC website at the start of the competition. Teams are encouraged to reference supporting files, such as graphics, photos or tables, for the Virtual Judges to review. Supporting files must be uploaded to the Mission Folder and must be clearly named. The maximum allowable size for uploaded files, per team, is 15 MB and/or 30 files. A single file cannot exceed 5 MB. Files not acceptable for uploading include .exe, .mdb, .scr., and .tif. Students can also reference their own web page if they choose to build one to support their Mission Folders. Completing and Submitting the Mission Folder A completed entry consists of a completed and electronically signed Mission Folder, including any supporting files. This includes the “Project Start Date Verification Form.” Team Head Coaches and parents are not required to review the Mission Folder before it is submitted; however, UTAXFC strongly encourages these adult sponsors and mentors to actively participate in the students’ efforts. Please ensure each of the subsequent steps is followed in order to submit and complete a Mission Folder. 1.Each team member must electronically sign the Mission Folder by selecting the check box next to their name, thereby attesting to its authenticity and completion, and that it is ready to be scored. Team Head Coaches are not required to sign the Mission Folder prior to submission. 2.The last student to sign the Mission Folder will automatically submit the Mission Folder for scoring. Mission Folders cannot be accessed or modified after they have been submitted. 3.Once the team has submitted its entry, a panel of Virtual Judges will review it based on the competition’s judging criteria. 4.If necessary, Virtual Judges may schedule a call to teams during the state competition judging period and conduct a question and answer session with students to ensure that the projects were completed by all of the participating team members. 5.Each of the First-Place State Winning Teams will be required to write an abstract (see appendix for template) to be submitted to the Regional Judging Panel. 6.The top four teams by grade level in each region will be called during the Regional Judging Period for a question and answer session with the Regional Judges, in order to help them determine the regional winners and ensure that the projects were completed by all participating team members. Each of the four teams must also complete and submit an abstract for its project to be reviewed by the Regional Judges. Contents of Application and Entry General 1.Each team member must make significant contributions to the success of the team and be a full participant in the development of the final Mission Folder. 2.While students are encouraged to seek guidance from parents, Team Head Coaches, friends, published sources, other collaborators and the Internet, the students must do their own work on the Mission Folder and must not permit any person (other than student members of the team) to perform such work. 1.Entries must be the original work of the students. 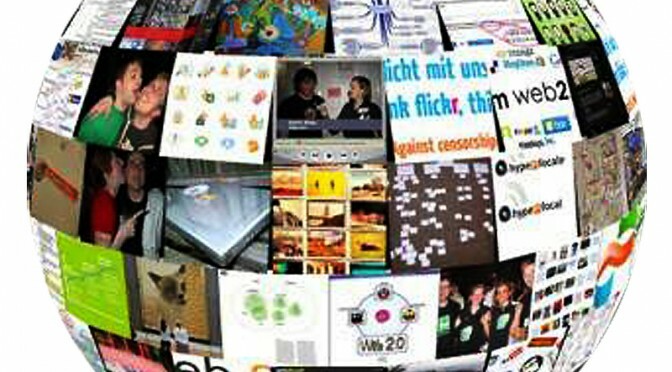 The word “material” as used in this section includes text, images and data included in the entry or otherwise published on the Internet. 2.An entry may include supporting materials that were created by another person if an accurate citation to the quoted material is included in the entry. In addition, no entry may include material that was created by another person without permission to quote such materials by the creator or owner of such intellectual property, and a copy of such permission must be made available to UTAXFC. 3.Quotations from materials printed in newspapers, magazines or books are permissible if reasonably necessary to illustrate a point or to give appropriate credit to an author and an accurate citation to the quoted material is included in the entry. 4.No entry may include any trademarked material(s) without the written permission from the owner(s) of the trademarked material(s). Previous Competition Entries 1.All work on the project must begin no earlier than October 1,2015. Students may use the same topic as in previous year, but must do completely new research and experimentation for the 2015-2016 competition. Failure to abide by this rule will result in team disqualification. 2.A team may submit a project that they entered in another science competition as long as research and experimentation for the Mission Folder began no earlier than October 2015. 3.Teams who have one in previous challenges in years past may use the same topic in the UTAXFC competition, but cannot resubmit the same exact project in future UTAXFC competitions. Resubmission is only acceptable if the students have performed new research, experimentation, ideas and solutions to extend the scientific inquiry. 1.Data that is publicly available and obtainable from a reputable, professional source. 2.Data that is gathered through observation of the subject in its natural habitat and does not pose a health risk to the subject by introducing a foreign object or stimulant. 3.Surveys intended to document the opinions or preferences of a study group. *Surveys must be approved by the team’s school administration. Each team conducting a survey must fill out the UTAXFC Survey Form (see appendix), have it signed by the school administration and upload the form as part of the Mission Folder submission. a.Students conducted experiments on the behavior/health of hamsters when fed natural food vs. artificial food. Experiment could potentially be harmful to the hamsters. Data must be gathered through observation of the subject in its natural habitat without posing a health risk to the subject by introducing a foreign object or stimulant. b.Students conducted experiments on the differences between makeup that has been tested on animals and that which has not. Test subject was one of the students on the team. Data must be gathered through observation of the subject in its natural habitat without posing a health risk to the subject by introducing a foreign object or stimulant. c.Students conducted experiments on fish testing the effects of polluted water. Some fish died. Data must be gathered through observation of the subject in its natural habitat without posing a health risk to the subject by introducing a foreign object or stimulant. An IRB is a committee that has been formally designated to approve, monitor and review biomedical and behavioral research involving vertebrates with the aim to protect the rights and welfare of the research subjects. UTAXFC does not participate in or sponsor the IRB process in any way. Teams who wish to explore this avenue must have successfully received IRB approval prior to submitting their Mission Folders and provide proper documentation. Please note that the approval process can take months, so plan accordingly. For more information on pursuing IRB services, please visit http://www.irbservices.com. •There is a violation of any portion of the rules, the required forms, or inappropriate conduct or misuse of the UTAXFC website or server by gaining access to areas that the user does not have explicit right to use or by using the server for purposes not related to the development and deployment of an entry. For example, a team, individual team member or user will be immediately disqualified if the team, individual team member or user gains unauthorized access to an area of the server other than the area designated for students or teams. •If an entry contains materials that appear to violate any of these rules, UTAXFC at its discretion, may disqualify the entry in its entirety, remove the materials from the entry which violate such rules or requirements, and/or withdraw an award that has not been previously paid out to the team. A final decision to disqualify a team or an entry may only be made by UTAXFC. Disqualification of Virtual Judges In order to avoid an actual or apparent conflict of interest, a Virtual Judge must not be closely related to team members or a Team Advisor of a team that the Virtual Judge is screening, evaluating or judging. Accordingly, no one may act as a Virtual Judge with respect to an entry of a team if he or she is closely related to any member or Team Advisor of that team, or otherwise feels that he or she might be, or appear to be, biased. Parents, Team Head Coaches, UTAXFC and Ambassadors cannot serve as Virtual Judges in the same competition year. A final decision to disqualify or remove a Virtual Judge may only be made by UTAXFC Producer. Competition Changes and Intellectual Property Extensions of Contest Deadlines UTAXFC may extend any competition deadline, and will post any such extension on the UTAXFC website. Ownership of Intellectual Property and the Rights and Duties of Parties An entry will remain the property of the submitting team. By submitting an entry, each individual team member grants UTAXFC a perpetual, irrevocable, fully paid-up and royalty free, right and license to use the entry in whole or in part for any purpose whatsoever, beginning with the submission of the entry and continuing until October 1, 2016. Such right and license includes, but is not limited to, improving, modifying, making derivative works, enlarging, distributing, and making such entry available for use by any person or organization. During such license period, UTAXFC will also keep such entry on its website, or any successor website, and can distribute such entry to any person or organization in any manner. UTAXFC shall have the right, but not the obligation, to take actions it deems appropriate to prevent misuse of an entry. The team members, and their parent(s) or guardian(s), may take such steps or actions to prevent misuse of the entry, as submitted, as they deem appropriate. Finality of UTAXFC Decisions Each decision of UTAXFC with respect to any matter related to any UTAXFC contest, shall, in all respects, be final and binding on the team member(s), his, her or their parent(s) or guardian(s), the school(s), and the Team Advisor, and shall not be subject to review. Modification of the Rules: UTAXFC Program Manager reserves the right to modify the rules to the extent that is fair and appropriate. Modifications will be posted on the UTAXFC website. Awards General Award Terms UTAXFC will adhere to all applicable tax laws and regulations relating to the payment of awards, including any applicable required withholding. All taxes on awards, if any, will be paid by the winners. Before presentation of awards, all winners must supply UTAXFC Mission Control with their full names, Social Security Numbers, birth date, mailing and phone information upon request. Students and Team Head Coaches who do not provide correct and complete information by the deadline provided are seen as refusing to comply with the rules and regulations of the competition and are forfeiting their claim to an award. Awards Classification •First Place State Winning Teams will receive up to $1,000 U.S. Savings Bond (Matured Value) per student. •Second Place State winning Teams will receive up to $500 U.S. Savings Bond (Matured Value) per student. Regional Awards •First Place Regional Winning Teams will additionally receive up to $2,000 U.S. Savings Bond (Matured Value) per student. National Awards •First Place National Winning Teams will additionally receive up to $5,000 U.S. Savings Bond (Matured Value) per student. Students on teams that score First-Place in Regional Judging will receive an all-expenses-paid trip to the Defense Media Activity. Exact location, dates and times will be announced later. Honorable Mention Teams with Mission Folder scores in the top 10 percent nationally within their respective grade level and are not place winners will receive honorable mention recognition. UTAXFC FIRST PLACE Winning Teams First and Second-Place Winning Teams at the state level of competitions will be subject to validation as a legitimate team. If a team fails to “pass” as a legitimate team per competition rules, then ALL team members of on that team will forfeit their award. If a First-Place Winning Team at the state level is not legitimate, then the Second-Place Winning Team will represent their respective state at the regional competition and may have the opportunity to earn the First-Place State level awards. If members of First-Place Winning Team are not able to make it to the Defense Media Activity culminating event and therefore cannot make a complete team, then the remaining team members will not be allowed to compete and ALL team members will be asked to forfeit their Awards. If the First-Place Winning Team is unable to represent their region at the national competition, the next highest scoring team in the region may be invited to replace the Regional First-Place Winning Team. Additionally, alternate teams may have the opportunity to earn regional awards if they are chosen to represent the region at the national competition. 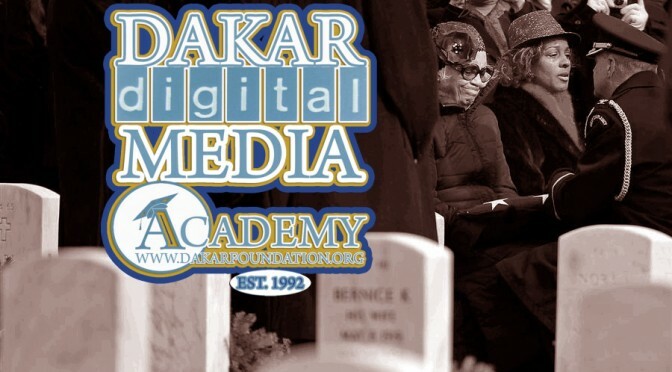 Dakar is in discussions with the Los Angeles Chapter of the Tuskegee Airmen Inc. about capturing the oral history of their DOTA’s. The proposal will include the Compton High School Television Program aka 90 Minutes TV . What happens when you host more than 900 events in eight cities? You get one incredible week that was Social Media Week. More than 25,000 of you joined us physically to experience SMW14 this February — and we love what we all saw.We connected in unique ways and dove deep into myriad topics. Thank you for making it what it is — and special thanks to our Global Headline Sponsor Nokia and Global Supporting Sponsors Spotify and Prodigy Network for making it all possible. Senior Director of International Reseach, Yahoo! Yahoo!’s Laura Chaibi took SMW Milan on a journey through the senses, discovering trends in the use of tablets and smartphones, and predicting the new relationship between the media and our senses. Hear more here, thanks to TIM! Noted as one of the top business thinkers in the world, Don Tapscott brought his expertise to SMW NYC to share how we can use our collective power to create change. It was an inspiring discussion that left us empowered. 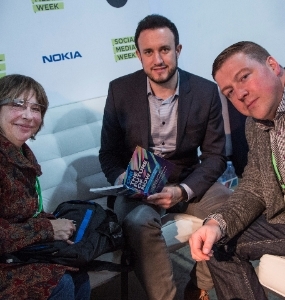 Hear it here, thanks to SMW Live by Nokia! Want to keep a piece of SMW with you? 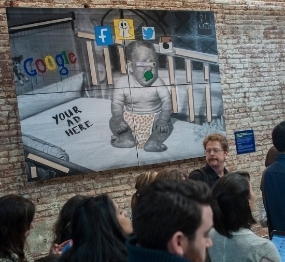 In SMW NYC, our giant baby was all the buzz. We teamed up with emerging street artist WhIsBe, challenging him to interpret what our shifting relationship to technology looks like, armed with the question: are we too connected or not connected enough?And now we are auctioning off this incredible unique piece of art, with 100% all proceeds given to charity:water. The auction ends Saturday, March 9 – bid here! During SMW14, we launched our first book, “On! The Future of Now: Making Sense of our Always On, Always Connected World.” Curated by our own Toby Daniels and Nokia’s Craig Hepburn, the book is made up over 20 essays and personal stories from a number of leading thinkers in tech, media, and entrepreneurship who share stories of how technology and social media has impacted their lives and work.The best part? The proceeds go to support charity: water. Pre-order the book nowhere! Billboard Africa and Beat 99.9FM led a day-long conference-within-a-conference addressing various areas of Africa’s booming music business and it’s accomplishments and challenges in the digital age. And you can still catch it on SMW Live, powered by Nokia, here! There’s a lot of startups emerging each year. How do you know which ones will succeed and which will fade? We partnered with Entrepreneur.com to highlight 10 we think you should take note of for 2014. See their demos and hear why we’re supporting them here!